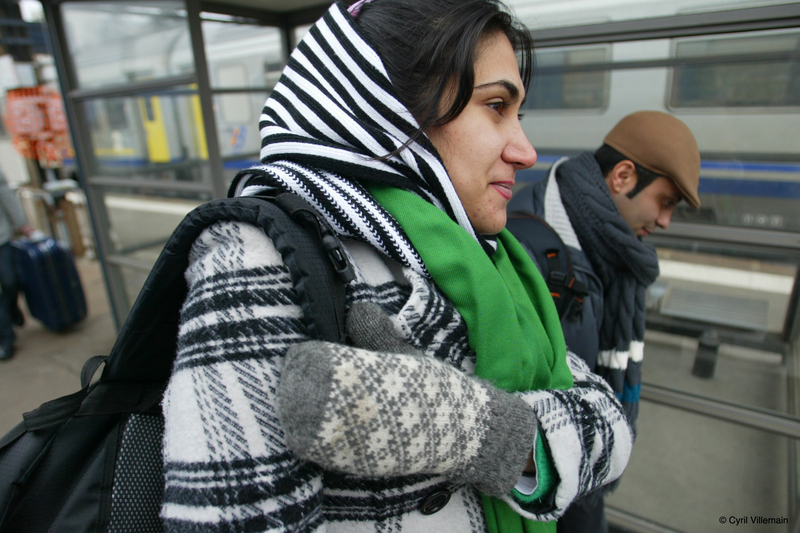 Iranian journalist Sepideh Pooraghaiee at the Dijon train station in France. She is seeking asylum in the country. Iranian authorities are once agan cracking down on the Internet. Internet connection speeds were degraded in several cities in advance of the Islamic Revolution’s 31st anniversary on February 2. This same tactic was previously used by the regime in advance of events likely to be used by the opposition to stage demonstrations. Several websites were also targeted by hackers, including the Radio Zamaneh, which was attacked by the “cyber-army,” a group linked to the Revolutionary Guard. The defendants are not allowed to talk to their lawyers -- and their lawyers are not given the specifics of what their clients are alleged to have done." Most alarmingly, the Iranian authorities are pursuing a deadly escalation of their strategy to silence bloggers. As I previously reorted on MediaShift, they were regularly arresting and convicting bloggers in order to put pressure on human rights activists and those who contest President Mahmoud Ahmadinejad’s re-election. Now, two Iranian netizens and human rights activists, Mehrdad Rahimi and Kouhyar Goudarzi, have been accused of trying to wage “a war against God.” The significance of this charge is that the Iranian government executed two men on January 28 in Tehran for similar reasons. Rahimi and Goudarzi are now facing the death penalty. The authorities have made it clear that they intend to execute “mohareb” (enemies of God). Rahimi, who edits the Shahidayeshahr blog, and Goudarzi, who writes his own blog, are both members of the “Committee of Human Rights Reporters,” which was created by students and bloggers to relay information about the crackdown that followed the disputed June 12 presidential election. But Rahimi and Goudarzi are far from the only bloggers facing a dangerous fate in Iran. In the latest trial, which began on January 30, 16 defendants are accused of being “mohareb” (enemies of God) and of engaging in activities hostile to national security. They include Omid Montazeri, a young reporter for various newspapers, who was arrested on December 28. Montazeri gave interviews to foreign media and wrote for Shargh and Kargozaran, two newspapers that were shut down by the government. He was arrested after responding to a summons to report to the revolutionary court. 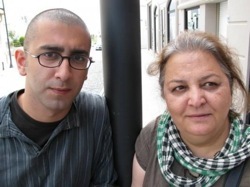 The previous day, agents from the intelligence ministry searched his home and arrested his mother, Mahin Fahimi. Both were eventually transferred to an unknown place of detention. As in the previous Stalinist-style show trials held in August, the defendants are not allowed to talk to their lawyers — and their chosen lawyers are not given the specifics of what their clients are alleged to have done. Instead, the Tehran state prosecutor appointed different defense lawyers with links to the intelligence services. Various reports state Montazeri is being pressured to confess links to foreign groups that are opposed to the regime. His lawyer has not been able to visit him or see the prosecution case file, nor has his counsel been told when Montazeri will appear in court. The lawyer is also not allowed to go to the court. It seems the regime intends to have him suffer the same fate as his father, a political prisoner who was murdered in 1988. This new round of political trials violates Iran’s own laws. Reporters Without Borders has warned the international community that the regime was now capable of taking this macabre scenario to the bitter end by executing journalists and bloggers. The regime’s leaders seem to think that executing prisoners will help restore calm in Iran. To them, fear is the same thing as peace. According to information obtained by Reporters Without Borders, several of the journalists arrested in Tehran after the December 27 demonstrations are being held by the Revolutionary Guard in section 240 of the notorious Evin prison. They are being pressured to make confessions. Contrary to Iranian legal provisions, their names do not appear in official prison registers, or on the justice ministry website. The authorities have said that “a change in judicial procedure not originally envisaged in the law” helps explain why lawyers are prevented from seeing their clients. They have also added a new process to investigations whereby cases are assigned to a “specialist” before being sent to the prosecutor’s office. During this special period, no information is given to the detainee’s relatives or lawyers. Mohammad Ali Ramin, a Holocaust denier and a loyal adviser to President Mahmoud Ahmadinejad, has issued several warnings and threats to the media, especially the print press. He has said that the purpose of suspending newspapers is to make them more compliant. Three papers have been shut down since January 14. There is some good news to report. Thanks to the support of the French authorities, 11 persecuted Iranian journalists and bloggers recently arrived in France and are seeking asylum. Some of them were joined by their families. On January 5, three reporters who were persecuted in Iran — Benyamin Sadr, Sepideh Pooraghaiee and Ghasam Shirzadian — found housing in Dijon, France. Reporters Without Borders is expected to receive financial support from the regional and departmental authorities to help cover their immediate basic needs, and also to help fund their integration into French society. This includes providing language courses and housing assistance. I think it’s really sad when bloggers and journalists are arrested or threatened for telling the truth or giving their opinion. Iran really seems to send a confused message about what they are really doing with their laws and legal system which appears to be possibly covering up what they are trying to do. Hopefully Iran will change their mind on arresting bloggers, which is doubtful, but if they don’t then I hope bloggers don’t become scared to give their opinion. We need people to report on what is happening in countries like Iran but I think bloggers should be very careful so as to not endanger themselves. Seems to me that an almighty god like theirs wouldn’t be too worried about a couple of pissant bloggers. This god couldn’t be all that powerful if he needs the Iranian government to fight his/her/its fight. and people here in the US wonder why so many are opposed to the mixing of politics and religion…. If this is “God’s will” then God can take a hike.